Nuri Sahin will be a Real Madrid player for the next 6 years, after being transfered from Borussia Dortmund for 10 Million euros. 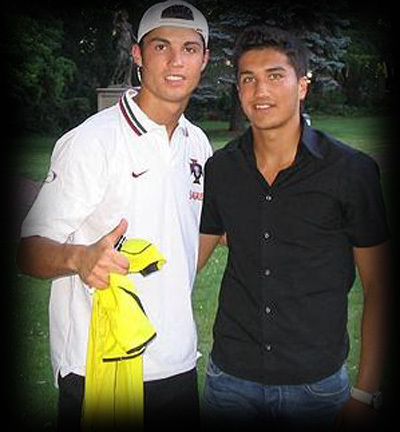 Sahin has a great respect for Cristiano Ronaldo and expects to have a big impact in Real Madrid. Real Madrid announced the transfer of Nuri Sahin this week, Borussia Dortmund wonder kid, born in 1988 (23 years old). The Turkish international played in Germany for the last years and helped his club to win the Bundesliga this season, by contributing with 6 goals and 8 assists in the league. Nuri Sahin already assumed his admiration for Cristiano Ronaldo in the past (watch the video where Sahin and CR7 met in 2008) and signed a 6 years contract with Real Madrid in a 10 Million euros transfer fee. Nuri Sahin: "It wasn't an easy decision to leave Borussia Dortmund. I like the club and the coach and I feel comfortable in Dortmund, but Real Madrid is one of the best teams in the world. Joining them means taking a great leap in my career." said the Turkish star player. This signing was a José Mourinho's wish, in order to improve Real Madrid's strenghts in the midfield and allows the possibility for the coach to rotate key players more often, without reducing the team's capacities. Remember that you can watch Villarreal vs Real Madrid livestreams, for the Spanish League, online here on ronaldo7.net, this Sunday. Cristiano Ronaldo will play on this match, attempting to increase his goal count break all records.